The Vampire Finch (Geospiza difficilis septentrionalis) is native to the Galapagos Islands - a group of volcanic islands distributed around the equator in the Pacific Ocean, 972 km west of continental Ecuador. Specifically, they can be found on Wolf Island, also known as Isla Wolf. This finch is a member of a large group of finches known collectively as Ground Finches. 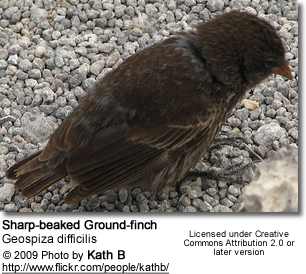 It is a subspecies of the Sharp-beaked Ground Finch (Geospiza difficilis), the only significant difference being its dietary preference. The Vampire Finch feeds on the blood of other birds, primarily feeding on the blood of sitting Masked Boobies and Red Footed Boobies. In order to feed they will peck the skin of the Booby with their very sharp beaks until they draw blood. Curiously their feeding does not appear to harm the Boobies and the Boobies allow them to do so. It is theorized that this behavior evolved from the pecking behavior that the finch used to clean parasites from the plumage of the booby. It is theorized that this behavior evolved from the pecking behavior used to eat parasites that live within the plumage. During extended drought periods, the seabirds’ blood is probably the most important food source for the vampire finch. They also drink the blood of their own dead. The Vampire Finch also feeds on Booby eggs, as well as the lubricating fluids released by the Boobies when they lay the eggs. The finch steals the eggs just after they are laid and if they are not strong enough to crack them (as might be the case with young vampire finches), they roll them into rocks until they break by pushing with their legs and using their beak as a pivot. These finches appear to be experts at stealing the eggs of inexperienced Boobies that may be laying for the first time. The vampire finch is sexually dimorphic, with the males being primarily black and the females grey with brown streaks. Its song is described as lilting. 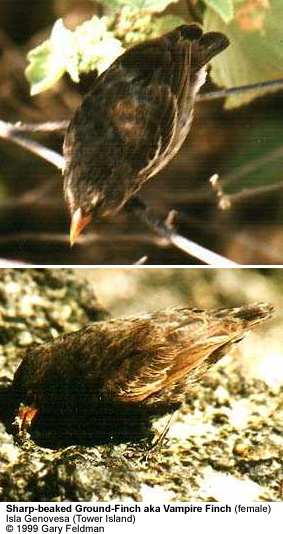 The vampire finch is highly endangered, and is only found on Wolf Island and Darwin Island.